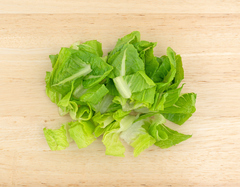 CDC, several states, the U.S. Food and Drug Administration, and the U.S. Department of Agriculture’s Food Safety and Inspection Service are investigating a multistate outbreak of Shiga toxin-producing E. coli O157:H7 infections. As of April 12, 2018, 35 people infected with the outbreak strain of E. coli O157:H7 have been reported from 11 states. Information collected to date indicates that chopped romaine lettuce from the Yuma, Arizona growing region could be contaminated with E. coli O157:H7 and could make people sick. At this time, no common grower, supplier, distributor, or brand has been identified. Illnesses started on dates ranging from March 22, 2018 to March 31, 2018. Ill people range in age from 12 to 84 years, with a median age of 29. Sixty-nine percent of ill people are female. Twenty-two ill people have been hospitalized, including three people who developed hemolytic uremic syndrome, a type of kidney failure. No deaths have been reported. The current outbreak is not related to a recent multistate outbreak of E. coli O157:H7 infections linked to leafy greens. People in the previous outbreak were infected with a different DNA fingerprint of E. coli O157:H7 bacteria. To read the full investigation notice, click here. For additional resources, including epi curves, case counts maps, advice to consumers, restaurants, and retailers, as well as the notice in Spanish, click here. For more information about Shiga toxin-producing E. coli and steps that people can take to reduce their risk of infection, click here. The Emergency Risk Communication Branch in the Division of Emergency Operations, Office of Public Health Preparedness and Response is responsible for the management of all COCA products. CDC and HHS logos are the exclusive property of the Department of Health and Human Services and may not be used for any purpose without prior express written permission. Use of trade names and commercial sources is for identification only and does not imply endorsement by the U.S. Department of Health and Human Services. Links to non-federal organizations are provided solely as a service to our users. Links do not constitute an endorsement of any organization by CDC or the federal government, and none should be inferred. CDC is not responsible for the content of the individual organizations.